Our proprietary LED array technology provides a very natural white light in daylight quality with a color temperature of 5000 Kelvin and with an outstanding high color rendering of 95 (Ra). The efficacy as well as the color rendering is exceeding the specifications of HID bulbs. A unique feature is the variable power with 5 settings ranging from 25-95 Watt. The unique optical design with diffuser and dome lens results a very soft and wide beam of 90_ on land as well as in water. There are no hot spots and the edges are smooth. The design is optimized for very small dimensions and light weight. 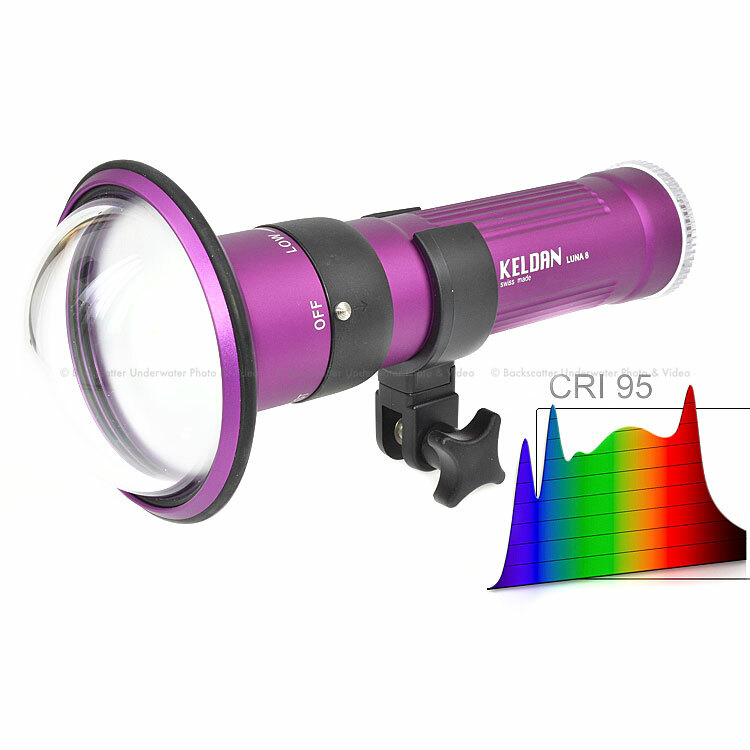 You do not find any other light on the market which is as small and powerfull than the LUNA 8 CRI. The complete set (light, bracket, diffuser) ads on_ly 0.14kg to your gear. The LED can not break and has almost unlimited lifetime. The LUNA 8 CRI us_es a rechargeable Li-Ion batterypack which offers much higher power density and less weight compared to NiMH batteries. The Li-Ion batterypack also offers better performance in cold water conditions than NiMH batteries do. The batterypack can be easily exchanged within a few seconds. An eight stage charge level indica_tor gives you the charge level while charging or diving.